Solar Roadways is a grassroots company that is a stellar example of a powerful new approach to business. Their business model is a perfect marriage between innovative technology and innovative finance. Solar Roadways are spearheading a new reality that levels the playing field and gives us reason to believe that we will find a way to meet our energy needs without fossil fuels. Solar power was discovered over 170 years ago, but it was only in the 1950s that it became a viable, albeit expensive, technology. However, the high cost of producing solar cells meant that the concept remained in limited use up until recently. The explosion of interest in solar power has brought investment and research that has vastly improved the technology. Solar energy is growing fast. According to a 2011 UN report, venture capital and private equity investment in renewable energy rose 19 percent in 2010 to $5.5 billion and solar was singled out as the main catalyst garnering $930 million from venture capitalists. In 2012, solar power worldwide reached 100GW installed capacity, up from 71GW in 2011 and 40GW in 2010. The US solar industry shattered records in 2013, adding 4,751 MW. Globally, the industry grew 35 percent last year. The number of solar jobs increased by 20 percent in 2013 which is 10 times the national average in the U.S. In Europe solar is already similar in price to buying energy off the grid. Germany is already deriving the lion’s share of its power requirements from solar. Solar is expected to be competitive with fossil fuels by 2025. Government and academic institutions are putting up solar panels, including the White House and Cornell University. Private industry is also showing significant interest in solar power led by companies like Walmart and Apple. Even the DoD sees the battlefield of the future as being powered by solar. Decreasing costs, increasing efficiency, large scale deployment, increasing cost of power, growing concern about emissions, and massive investments are all helping the solar sector to grow. There are a number of factors driving the growth of solar, but chief among them is innovation. Innovations that hold great promise range from small solar lighting to massive space based solar arrays. Other innovations include solar shingles, solar glass, solar panels made from weeds, solar cells that can be printed on paper and solar spray paint. Innovative applications of the sun’s power also includes things like a solar sponge which can harvest and sequester carbon from the air. Solar powered transportation now encompasses a wide range of vehicles, from solar planes and yachts to the super fast Hyperloop concept. Off the grid solar powered cars (like Luminos and Stella) have been around for a while, but now major automotive brands are getting in on the action. Ford recently debuted its first off the grid solar powered car at the CES. Innovation is not limited to the technologies being produced. New manufacturing approaches are using solar energy to make solar panels and new financing models are already replacing government funding. Solar panels are finding their way into a number of different applications that extend far beyond traditional solar arrays. Researchers at George Washington University built a slip-resistant solar sidewalk, the Virginia Science and Technology Campus in Ashburn, Va. developed a solar-powered trellis and Occidental College in Los Angeles created an artistic combination parking lot carport and a hillside ground-mount on its campus. One of the most promising sun powered innovations involves a technique of embedding solar panels that can withstand vehicular traffic on roads. In addition to addressing our energy needs, this technology could provide a host of other benefits. A company called Solar Roadways is the Brainchild of Scott and Julie Brusaw. They believe that roads built out of solar panels could supply all of our country’s energy needs several times over. Each mile of roadway could supply the energy requirements of as many as 500 homes. According to an estimate made by Caltech solar energy, expert Nate Lewis, covering 1.7 percent of the U.S.’ land surface (which Brusaw suggests is equivalent to U.S. interstate highway system) with 10 percent efficient solar energy converters, would supply the nation’s current energy demand. 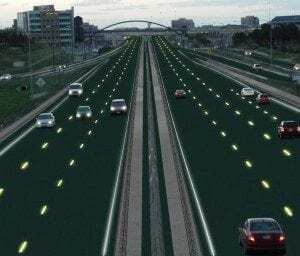 The system could reduce gridlock by reconfiguring travel lanes, warning drivers of impending construction, accidents or adverse weather events and even protecting wildlife by keeping them off the road. The solar cells create energy to light the road at night and heat the road to melt the snow and ice in the winter. These roadways are also capable of repositioning power lines and all kinds of data cables underground. Such a configuration would eliminate cell phone dead spots along solar roadways. The Solar Roadways system could even store, treat and redistribute storm water which is responsible for over half of the pollution in US waterways. Another innovative aspect of Solar Roadways is their approach to finance. To help them achieve the refinements that will enable them to move to the commercial production stage, they launched an Indigogo campaign that started on Earth Day, April 22, 2014. In addition to generating seven million page views, they significantly exceeded their goal of $1 million by raising more than $1.5 million. The funds raised through the campaign will go towards hiring a team of engineers and other professionals. It will also be used to streamline the production process and move into the manufacturing phase. The wide range of benefits are staggering when you consider that the estimated cost would be only $4.84 billion. The Solar Roadways project represents the kind of technological and financial innovation that could very well be a game changer in efforts to combat climate change. I hope the ability to make and store solar gets much cheaper. In the meantime, we should also promote some kind of closed cycle nuclear. If we don’t then we will need about 1% of the land to power 10 billion at a decent standard AND we will need millions of large wind turbines AND at least a whole days worth of GLOBAL power storage (to make up for the lousy 25% CF of solar and wind). We will ALSO need to attain the clean energy necessary to properly sequester half a trillion tons of excess CO2 from the biosphere. Solar and wind are good, but not good enough (yet).